Eric Molina – We’re very excited about the fight, the opportunity to go down to Alabama. We know it’s going to be a very hectic environment down there, very uncomfortable environment, but Wilder is the champion, and he gets to enjoy all these privileges of all the guidelines of where we fight and all the logistics of it, so we’re excited for the opportunity to fight for the heavyweight world title and we are very prepared. Training camp is going extremely well. We’re closing up our training camp on Saturday, and we should be ready to go down to Alabama on Monday. Everything’s looking very good, and we’re ready to go. L. DiBella Thank you, Eric. Fight week, next week, there’ll be a slew of events leading up to the fight, including a workout on Wednesday and a public weigh-in on Friday. I’d like people to follow AlabamaTitleFight.com for all details as they’re updated, including a lot of details about stuff that’s open to the public and that the people of Birmingham can enjoy during fight week, so that’s www.AlabamaTitleFight.com. One of the proudest sons and the greatest sons of Birmingham, Alabama, is a young man who’s a physical specimen. He’s 33-0, with an incredible knockout rate of 32 KOs in 33 fights. Deontay Wilder had a brief but decorated amateur career that concluded with a trip to the Olympics where he won a bronze medal for the United States. 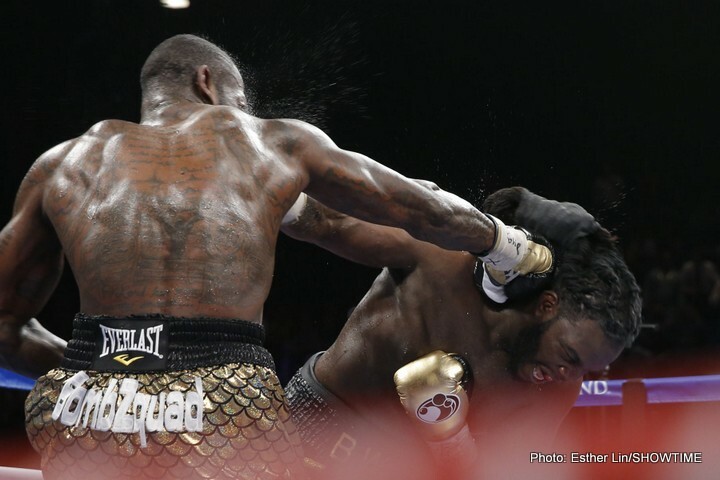 He won a 12-round decision over Bermane Stiverne in January to become the WBC heavyweight champion. In his professional career he’s knocked out former Olympic gold medalist, Audley Harrison in one round, former heavyweight title holder, Sergei Liakhovich in one round. He only began boxing in 2005, and his quick ascent in the sport was pretty amazing and actually the inspiration for a children’s book called Deontay the Future World Champ, and I guess that children’s book was prophetic because it’s now Deontay, the World Champ. He was born in Tuscaloosa, grew up a diehard Crimson Tide fan, and he’s returning home to fight in Alabama for the first time in three years to defend his WBC heavyweight title for the first time. So, it’s my honor and pleasure to introduce WBC heavyweight champion of the world, Deontay Wilder. Hello, guys. I’m excited to have this opportunity to get back in the ring and display my talent more. All the people that are going to be watching and the people that are going to be in attendance, it’s a pleasure and an honor to be able to get in the ring to do something that I love to do and I have a very strong passion about, so I’m excited about June 13. I’m excited about coming to my home state of Alabama. When I set forth becoming the undisputed heavyweight champion of the world, I got one part of it becoming the heavyweight champion, the WBC heavyweight champion of the world. I’ve still got a long way to go, but I’m honored and pleased to have my very first title defense in Alabama. We’re going to make history come June 13 by having the first title fight of any division in the state of Alabama, and that’s a pleasure and definitely an honor to me. So, me and Eric will definitely be witnessing and making history come June 13. I appreciate him for signing the contract and accepting this opportunity. A lot of guys don’t get an opportunity to be able to fight for a world title, and I congratulate him on the opportunity. I know it’s going to be a great fight. He’s going to come to fight, and that’s what I expect. I expect a great fight. He’s someone that got a big bark but want a big bite in the ring as well too, so that’s what I expect. To all my fans, he’s coming to enemy territory. He’s coming to an arena filled with nothing but majority of hometown people in the state of Alabama, so that’s a tough environment to come into and then facing one of the most dangerous guys in the division to date. So, I applaud him for that. I’m just ready. I’ve been waiting for a long time to get back in the ring. After my last fight, I want to stay consistent. I want to stay busy in fights. I love to do this. God gave me the opportunity to do this. I’m going to keep doing it, keep giving the fans what they want to see, and that’s great fights and defending my title as much as possible. You can tell by my voice that I’m super excited. I can’t wait. There’s nothing like what I do, my job, and that’s to whoop a**, and I can’t wait to get up in there come June 13. Thank you, Deontay. Well, now we’ll open it up for questions. As my understanding is, Deontay, a couple years ago, or three years ago, whenever it was, not that long after you turned pro, that the people in Alabama really created the boxing commission that is there to regulate the sport basically because they wanted their favorite son, Deontay Wilder, to be able to fight in the home state and to put on these kind of big shows. When that happened, was the ultimate goal for you to put on a big event in your home state? This definitely was the ultimate goal. My trainer and co-manager, Jay Deas, we set forth a goal to getting a commission here. We had a lot of great champions that’s from here but couldn’t get fight due to the fact that there was no commission here. I already had plans of after the Olympics turning pro and staying and residing here in my home state. I had a vision for this state. I wanted to make it bigger than just college football. I gave them opportunities to have a professional sport here, and that’s boxing, so once we got our commission, it was uphill from there. A lot of people have gotten on board. A lot of people have never troubled with boxing, period, in their life, until they read about the story of my movement, what’s going on, and a lot of people had lost interest in boxing until they read about my story, my movement. Now, they’re on board. So, it became a bit of a thing for the state of Alabama now, so they put me on top as far as the sport is concerned here in the state of Alabama because there’s nothing like a world sport, nothing. Nothing national can compete with a world-level sport. I was wondering if you could mention who are some of those other top contenders that you guys looked to fight before you decided to make an agreement with Eric? Well, at this moment, I feel like stating names is irrelevant right now. Next week will be fight week, and everything is focused on Eric Molina. That’s the main focus, and I love the guys. It wouldn’t do any good stating names. They had the opportunity. Eric stepped up to the plate, and we’ll congratulate him. We’re going to put on a great performance June 13. Well there are a lot of casual boxing fans out there that really don’t know too much about Eric Molina. I have been in pretty big fights. I fought Tony Grano, the NABF champion, ranked in the top 10 in the world for over a year. If you look at my record, you see two losses. In the casual boxing sense, you see those two losses. Only a fighter knows how hard it is to bounce back from losses like those. So, the casual fan doesn’t say ah, well, they say he’s got these two losses, but I know what I’ve been through to come back from my losses, things that I’ve learned from my losses, and I positioned myself back into being a top contender in the world. A lot of these fights on my resume, you see fights, but you don’t see the other angles of what’s on the table, how long I had to prepare, the things I had to go through outside of the ring, so I’m glad that June 13th is coming up. We’ve had a very smooth training camp, and I’m coming in with everything. I’ve never been this prepared for a fight before. I’ve never had the privilege to come in this prepared for a fight, so we’re excited about it. Eric, because your two defeats were in the first round, and because Deontay has so many first-round knockouts, he’s a fast starter, how pivotal is getting through the first round in this fight? Well, it’s definitely important. I think that this is definitely a fight that from the first bell, I think it’s going to be a fast-paced fight. Deontay Wilder’s a big puncher, but I feel that I’m a big puncher also, so I think that it’s very important to be ready from the first bell. Anything could happen at any given second. It’s a heavyweight world title fight. Do you kind of feel that some pressure’s off of you to try to knock out everybody, or have to knock out everybody? I mean, you can say so, but I don’t live my life with pressure. I’m an easy-going person. I’m the type of person, people’s opinions about me doesn’t matter, especially when I’m in the ring because I know that everything I do, I prepare for, I train hard for each and every time, in camp, in training. I’m always training, I never stop. I don’t take any days off. I’m always training because I love to do this. I love to box. I love to be able to get in there and perform for the fans, so I don’t have any days off. But you can’t please everybody. There are too many billions of people in the world to try to please every opinion, to try to please everybody. Even when people said things about me, what I couldn’t do, my last fight I proved everything to them. That made me an even more dangerous fighter because now people know what I’m capable of doing. Not only that I’m a puncher, but I can box. I can have fun. I can go 12 rounds and make it seem like it is nothing. I can take a punch. That’s nothing, but we’ve been telling people for years what I could do, just needed the right person in there for me to display my talents. There’s no pressure on me at all. I don’t go in there and try to look for the knockout, anyway. I go in there and let my hands go, and if I get the knockout, I get it. I would prefer the knockout, of course. This is a heavyweight division. It’s all based about power. When people get dressed up and come out to that fight, they come to see a knockout. They want to see a couple of rounds or whatever, to see what kind of skill and will that person has, maybe a little heart, and then they want to see the knockout because they’ve got other things planned for that night. And when they come to see a Deontay Wilder fight, that’s what I want to bring them. I want to bring them knockouts, but that last fight, it meant so much more than just a knockout because I did, I wanted to prove to people what I was capable of doing. I think that particular night, winning a title, that was the perfect moment to prove what I’m capable of doing and what I’m all about. So, now it’s time to get back on to my knockout streak like people expect from me, and that’s what I want to do, so here we go, baby. Lou, how were the ticket sales for the fight coming up? The ticket sales have been fairly remarkable, actually, 7,500 tickets already sold. The capacity’s 8,500, so we’re not even in fight week and we’re looking at a sellout. We’re not in the last few days, and we’re looking at a sellout. I think we’re going to sell out before there’s a walk-up. Deontay, how does it feel just to go 12 rounds? It’s something you hadn’t done yet in your professional career, and how did it feel just to not to say get the rounds, just to quiet a lot of the critics. That was the one knock against you, how would you do in a 12-round fight? To go 12 rounds is, it’s something I do in training, I do in camp. The hardest part in boxing is not the part where you go out there and compete and fight your opponent. It’s the training part. That’s the hard part, the training, what people don’t really see. They think fighters just go out there one night, they fight 12 rounds or less, and then that’s it, they get paid, oh, that’s it. But the hard part is in camp, what you do in training, what you do in camp. That’s the ultimate hard part of it and we-12 rounds is nothing. I’ve been telling 12 rounds is nothing to me. It’s an appetizer. Most of the time, we go 15. After getting my belt, I was traveling for three months. I got right back in the gym and did 20 rounds, easy, because I’m never out of shape. I’m always full of energy. I love to do this, so to go to 12 rounds, that wasn’t anything. As you can see, I still had energy to go even six more, seven more rounds in that fight. But to silence the critics, now, we’re talking about something. To silence the critics, that was such a joyful feeling for me. That right there meant a lot to me because like I said, we live in a world that’s based on opinions of many people. Some people know what they’re talking about. The majority of them and most don’t know what they’re talking about, and it was a remarkable feeling to be able to silence the critics. It was even enjoyable to see their faces, to see their voice, to have to eat their words. That was enjoyable right there. Did you ever think that in your wildest dreams this fight next Saturday would be taking place? I did dream it. Sometimes things start with a dream, and they say dreams do come true, but dreams only come true if you allow them to. It is not just going to come true just because you had dreamt it. You’ve got to dream it, and then you’ve got to apply some kind of ultimate goal to it. Then when you set a goal, you’ve still got to apply self-preservation, as far as gaining that goal and making that dream come true. I dreamt it. I spoke it into existence. I believe in the power of the tongue, and I made my dream come true, and now we about to have it, about to make it the biggest thing in the state of Alabama. It’s just a blessing. I told people before, I’m a blessing to the state of Alabama, and a lot of people have agreed with me, that’s for sure. So, I am very honored to be able to fight in my state because a lot of fighters can’t fight in their state. A lot of fighters don’t have a home to come to, they have to fight elsewhere, but I have the honor and the privilege to have a state that’s behind me and has loved me, and I’m looking forward to it. And like I said, me and Molina are going to make history that night. Win, lose, or draw, we’re going to make history that night in the state of Alabama. How do you try to eliminate the distraction of fighting at home, people talking about bigger fights for you in the future? How do you focus on this particular fight and not look forward or not get kind of caught up in the hoopla now of being the heavyweight champion? Well, for me it’s just when I look at an opponent, the task that lies at hand, I automatically focus on that. I can’t look past nobody. I can’t put nobody aside. I treat every opponent that I get in the ring, no matter what their record is or what their resume may read, I look at this opponent as if he’s the most dangerous person in the world. I look at an opponent as if I’m still a contender trying to gain me a world title, and that’s how I do all my opponents. And by doing that, it keeps me focused. It keeps me humbled as well too to do what I’ve got to do because this is boxing, and this is the heavyweight division. Anything can happen in boxing. No man can ever feel like he’s bigger than the next person because once you start doing that, you start loosening up, your training starts to get a little lighter because you’re not training, you don’t have that hunger any more, and a lot of things will start to get exposed. People take advantage of that and feel confidence in themselves. So, I don’t want to be that type of fighter that I feel like oh, I’m at the top now, I don’t have to train as hard as I was when I was a hungry fighter, because I’m still hungry. I’ve still got goals, I’m still looking to do things in this sport to make it bigger and better. I tell people all the time that even though I’m the WBC heavyweight champion of the world, my heart still feels like a contender, and by my heart still feeling like a contender, it keeps me humble. It keeps me grounded. It keeps me very, I mean, very, very hungry. To quote Ric Flair, ‘To be the man, you’ve got to beat the man.’ And you know, the man in the heavyweight division for the last decade or so has been Wladimir Klitschko. A lot of people are discussing you as the heir apparent to that, so while you’re staying hungry and moving up the chain and continuing to fight, is that something that’s in the back of your mind, and do you think that’s something that you’re going to have to conquer to truly be the full heavyweight champion of the world? Well, I’m going to put it like this, that fight is titled not if it’s going to happen, but when it’s going to happen. Of course, that’s something I think about, but at this moment in time, I’m not focused on him. He will get his turn as well too, and last time I checked, I have the most prestigious, most well-known, most precious, beautiful belt in all of boxing, something that’s been around for a very long time, and that’s the WBC crown, it’s something that everybody wants. So, I have that. I’m the owner of that, so I’m not worried about anything else. Right now, it’s all about Deontay Wilder and Eric Molina, and that’s what I’m looking forward to, Deontay Wilder versus Eric Molina. Eric, is it motivating to you to — when you hear people say that you’re just someone to help Deontay — a spotlight matchup, a homecoming match, someone that he can look good against? Does that give you even more motivation than just the fact that you’re fighting for the heavyweight championship of the world? It definitely motivates me more because people have their opinions, and like Wilder said, a lot of people don’t know too much about different angles of boxing, so people don’t want to give me a shot, people don’t think I have a shot, and that’s fine. I’ve used it as motivation. I’ve definitely trained hard. I’m stronger than I’ve ever been, and I’m not here to convince people to give me a shot or not. I know what I bring to the table. I know the size and strength that I bring to the table, and I don’t have to convince nobody to root for me or to give me a shot or to believe in me. The people that love me, the people, my family and my fans, they believe in me, and I believe in myself, more importantly. So, we’re coming in, I’m coming in June 13th, and I’m blessed to, well, God has given me more strength than I’ve ever had, and I’m excited, and we’re good to go. Deontay, you had spoken about obviously being Alabama’s fighter, Alabama’s hero. There’s some deep divisions in the state there. You’re from Tuscaloosa. You’re an avowed Alabama fan. Have you united even the Auburn people behind you? I’m representing — Alabama football has its own rival and different things like that, but this is not Alabama football, this is a heavyweight championship world title fight, and I’m representing not only just Tuscaloosa, I’m representing the whole state. I’ve got the whole state behind me. This is a worldwide event, so I just can’t say I just got Tuscaloosa or have a rival with Auburn. No, I’m representing the whole state of Alabama, and the whole state of Alabama is behind me. That’s the unique and the special thing about it, that I’m representing the whole state, and people love that. I’m looking forward to – definitely it’s going to be a packed venue, that’s for sure. I’m looking forward to that and moving on to an even bigger venue than the state of Alabama. We’ve got even bigger venues, and I’m looking forward to packing everything out, but right now it starts with the Bartow Arena. I’m looking forward to displaying my talent there and making history right there, the first title fight in Alabama in any division right there at Bartow Arena. Klitschko was extended a little bit in his last time out with Bryant Jennings. Did you see anything there that led you to believe that this guy’s not Superman? I mean, we all did. We all seen loose holes. We all see something that was there. If anybody says they didn’t, then they’re a liar. We all seen that, but when that time comes, I’m going to execute those things that I saw. But right now, it’s hard to talk about another fighter when you’ve got one fighter that you’re getting ready to face and is on the phone now. My focus is not on another fighter because if I don’t get past him, we can forget talking about anybody else. It’s irrelevant to talk about anybody else if this fight isn’t done. It’s not over yet, so it’s hard for me to state or talk about another fighter when I’ve got a task that lies at hand. Once I get finished with Molina, then we can come back and talk about Klitschko. Do you give Tyson Fury much of a chance against Wladimir, and whether or not he gets wiped out against Wladimir, is that still something you’d like to do, come to England and take Furyon, shut his mouth up? I give Tyson a great percent of the chance of coming in and being a new world champion. It’s all going to depend on him, how serious he takes this business, this game, how serious he takes training and the preparation for that. I wish him luck on everything he does and on becoming the world champion. There’s nothing like setting a goal to become a world champion and being that, seeing your hand raised high with that belt saying you are the world champion. It’s a great feeling to be a world champion, so it’s going to be up to him. Like I said before, we’ve seen what Klitschko did in his last fight, and we’ll see how he can adjust to a bigger fighter. These are bigger guys now, and that’s what’s running division, the bigger guys. That’s fine. All the taller fighters in the heavyweight divisions are taking over, so we’ll see what Tyson has lies ahead, so we can only wait. Deontay, do you think you could be bigger for boxing than Floyd Mayweather? Oh, definitely. Most definitely, and I say that with high confidence because the heavyweight division is the cream of the crop in the first place, and the things that I bring, the excitement, the personality that I have, everything about me is all me, is totally me. Some people, some guys when they have cameras in their face, they pursue to be a certain type of person. Their persona about them changes or whatever, and then when the camera is off, they’re a whole totally different person. I don’t have flip personalities. I’m not a fake person. Everything about me is real, everything you see, even the ALL ACCESS (on SHOWTIME). You know, you all watch the ALL ACCESS, everything is me. Nothing is scripted. Nothing is planned out, nothing. I can’t sit back and let somebody script something out about my life and what it is because it’ll be fake, and I won’t be able to go through with it because it wouldn’t be me. So, I think I bring a lot of excitement to this division. I have woken up a lot of people as far as friends to come back to the division and stuff like that, and I know I’m doing the right things. People love me. That’s what it’s all about, but I’m just glad to be a part of the movement because we’ve got a lot of other exciting heavyweights that have made it – come back alive again as well too, whether it’s bashing up the talking or whether it’s the excitement of the performance of their fights. So, the division is definitely on the rise, and I’m looking to be the biggest thing in boxing, period. Deontay, you’ve said several times that your focus is just on this fight and Eric Molina and not anybody else in the heavyweight division. Could you talk a little bit about what you know about Eric Molina and why you think you’re going to be victorious in this fight? Well, the only thing I know about Eric, he’s got a nice size as far as height-wise. His weight, I know the record about the guy, and he looks pretty exciting. He’s not the biggest, or tallest, but when people see two tall guys, I think he’s 6’5″ and I’m 6’7″, so when people see two big guys get in there, they automatically see the excitement and thrill, what they can bring. I’m not the type of guy that looks at any kind of films or nothing like that. I don’t believe in it. I’ve never done it in all of my career, and I’m not going to start now. I like to have a challenge. I like to be surprised in the ring to see what they have so I can adjust to that fighter when I get them in the ring. Why do you think you’re going to be able to win in this fight? What are your advantages? You’re the favorite, obviously, but why do you think that’s going to play out? Well, my confidence is at an all-time high. I’m always confident in any opponent that I get in the ring with. That’s just my mentality. I feel like if you don’t believe in yourself, then it’s hard to convince or motivate somebody else to believe in you. You can have all the greatest trainers and all the strength trainers, the top of the line strength trainers in the world, but if they don’t really believe in what you’re doing, you don’t really believe in yourself first, then you can’t get those guys to be motivated to believe in yourself. So, first and foremost, I believe in myself. My confidence has always been over the top, no matter what opponent I get in the ring with. A definite advantage I have is my speed, my footwork and the power that I bring. My defense is remarkable with my footwork. My athleticism kills a lot of the fighters, and that’s what I’m going to bring to the ring. So, I’ll come through anybody. They’re all going to try and come, and that’s what they’re supposed to do. I just hope they come in the hopes of really trying to take it. That’s what I’m looking for. I’m looking for a guy that’s very hungry, that’s really trying to take this belt, to make this exciting. I want the most challenging opponent that I can get. Eric, obviouslywe know that Deontay’s the favorite. He’s going to have the crowd behind him. Why do you think you can win this fight being the underdog? I’ve realized one thing, that people keep saying Alabama this and Alabama that. We know how hectic it’s going to be going down there. That’s what the heavyweight world championship belt’s all about. You can’t expect to go in and fight no easy fights. I mean, you want to become champion, you’ve got to go through hell to get it. I’m expecting to go down to Alabama. It’s going to be a hard situation, a very uncomfortable situation, his backyard, his people, his commission, his everything. But to be heavyweight world champion, this isn’t easy, so I’m excited. I’m mentally focused to go down there and face all these things. Number one, I want to bring that title back. I want to bring it back home. And like I said, if people don’t give me a shot, I don’t got to convince them to give me a shot or not to give me a shot. I know what I’m bringing to the table. I know what I’m coming to do, and that’s all that counts. Eric, howmuch do you think you’ve improved as a fighter in the last few years? Because you know everyone’s going to look at your record, they’re going to look at the loss to Arreola three years ago. How much do you think you’ve improved since then? Well, I’ve always believed that special fighters are able to learn from their losses, but not all fighters can learn from their losses. I believe I’m a special fighter because I’ve learned from my losses, and I know I’ve learned from my losses. I’ve been able to bounce back. I’ve been able to be a better fighter. I’ve been able to put things together better, and I mean, a lot of things about my record that people don’t really understand is how hard it is for somebody to bounce back from some of the losses that I’ve been through, how hard it really is. So, I’ve definitely handled those things that were very challenging, and I’ve regrouped. I’ve put myself back together. I’ve become a contender again, and I’m definitely a stronger, more experienced, more confident fighter. And I’m ready. That’ll be it, guys. Thank you, Deontay. Thank you, Eric. Thank you, everybody, for joining us. Just one more time, the event will be at the Bartow Arena on the campus of UAB in Birmingham, Alabama. Tickets are $25, $50, $75, $100, $150, and $200, but there are less than 1,000 tickets left. We expect a sold-out house of about 8,500 shortly, so get your tickets quickly at UABSports.com and AlabamaTitleFight.com. Showtime Championship Boxing will be on the air at 9 p.m. Eastern Time, 8 p.m. Central Time, 6 p.m. Pacific Time. The doors open to the arena at 3 p.m., first fight at 3:30 p.m., and thank you all for joining us. “WILDER vs. MOLINA,” a 12-Round fight for Wilder’s WBC Heavyweight Championship, takes place Saturday, June 13, at The Bartow Arena in Birmingham, Ala. DiBella Entertainment and Bruno Event Team have joined forces to bring this event to Alabama. In the co-main event co-romoted by DiBella in association with Universal Promotions, Jose Pedraza will face Andrey Klimov in a 12-Round bout for the IBF Jr. Lightweight World Title. It will air live on SHOWTIME® (9 p.m. ET/ 6 p.m. PT). The telecast will also be available in Spanish via secondary audio programming (SAP). Preliminary bouts will be televised live on SHOWTIME EXTREME (7 p.m. ET/PT, delayed on the West Coast).